The average cabbage weighs between one and eight pounds. 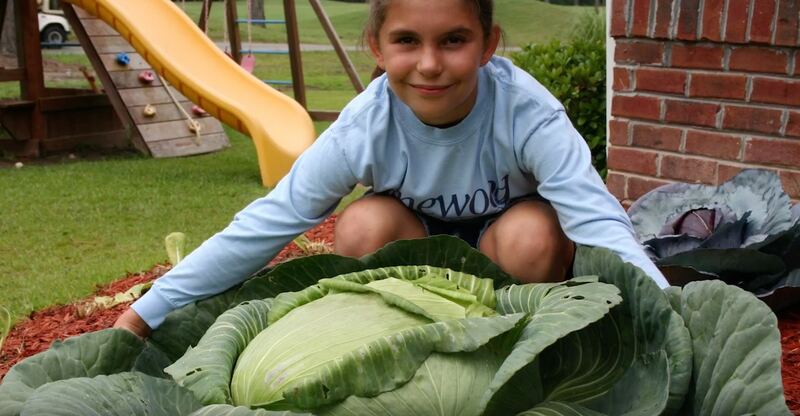 In 2008, a nine-year-old girl grew a cabbage so large it could have come from a fairy tale about enchanted vegetables. Katie Stagliano never meant to grow a cabbage that would’ve made a fairy godmother proud. She was just a third-grader bringing home a school project that was meant to inspire her green thumb. She tended to the cabbage every day. And every day, the tiny seedling she’d planted got bigger. It quickly surpassed one pound, then two, and then 30. By the time the cabbage finally hit maturity, it weighed 40 pounds. What to do with a behemoth cabbage? Once harvested, Katie decided to donate it to a local soup kitchen where it would feed more than 275 people. Turns out the cabbage really was magical. It inspired Katie’s love of gardening and — more importantly — her desire to give back. Seeing how much of an impact one cabbage got Katie thinking. At only nine years old, she realized how important it was for everyone to have access to fresh and healthy food. At the same time, it was clear that not everyone had such access. The statistics, in fact, are sobering: one in eight people go hungry in America each year. That’s 40 million people, 12 million of which are children. That clinched it for Katie. Before her age reached double digits, she’d made it her mission to end hunger in America. While it started from a gargantuan cabbage, Katie’s nonprofit that she leads today has grown bigger than any cabbage ever could. General Mills is a big part of that. Katie’s Krops started with one garden and a few volunteers. Today, the organization boasts over 100 gardens all over the country. Katie’s Krops provides the volunteers who run them with small grants to help those gardens flourish and yield plentiful produce for the food insecure. In California, a young man named Joey has provided Shepherd’s Gate, a women’s shelter, with the only fresh fruit and vegetables the shelter gets. In Ohio, the students at West Carrollton High School are growing fruits and vegetables for more than 450 homeless people right on campus. It was the first time many of the students had ever learned about agriculture. Thanks to this incredible chain of agricultural efforts, in 2018, Katie’s Krops donated 38,342 pounds of produce across America. In 2018, Katie was the winner of General Mills’ first-ever Feeding Better Futures scholar program. The contest, which was designed to give today’s youth a chance to make an impact on how we, as a society, fight hunger, reduce food waste and grow food more sustainably. It perpetuates General Mills’ decades-long commitment to both philanthropy and making sure that all people, everywhere, have enough to eat and love what they’re eating. Katie was awarded $50,000 to continue developing her organization so she can feed even more people. She was mentored by industry experts and presented her project at The Aspen Ideas festival. And business is still booming. Volunteers have given more than 1,000 hours to ensure the success of Katie’s flagship garden in South Carolina. The produce grown their goes has been donated to food banks and cancer centers. Food is also given directly to families and individuals in need and used for Katie’s Krops Dinners — regularly scheduled events where anyone in need can eat a free, hot meal in the company of their community. Volunteers also prepare care packages, distribute books, toys, school supplies, and clothing to those in need. Katie doesn’t think anyone is too young or too small to make a big difference. She doesn’t see obstacles — only opportunities. That’s the way that General Mills looks at the problem of world hunger, too. It can be overcome with passion, empathy, and innovation. If Katie’s story has inspired you, then it’s time to take action. If you’re between the ages of 13 and 21, now is your chance to be a part of keeping future generations fed. Submit your creative ideas for ending hunger to General Mills by February 26th, 2019, and you could win $50,000, life-changing mentorship from industry leaders, and an even bigger platform through which to share your ideas for change. Two additional finalists will receive $10,000 to kickstart their projects. The deadline is quickly approaching, so now’s the time to get cracking on your entry! Solving global issues like hunger takes innovation. It requires us to work together. Katie’s ending hunger one vegetable garden at a time. How will you make a difference?